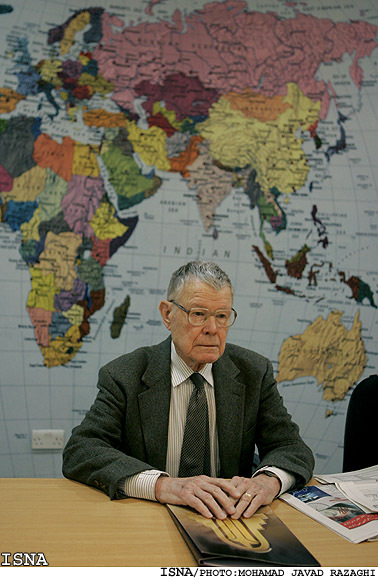 Over the weekend I spoke with Thomas Schelling, who won the 2005 Nobel Prize in Economics for his work on game theory and collective bargaining. Schelling's early work was about war and arms control, but I wanted to speak with him about a different collective bargaining problem that's been in the news: Global climate change. Climate change presents the world with an incredibly complicated bargaining arrangement. The big costs will be born by future generations, and born more heavily by countries other than the United States. The responsiblity for those costs is also distributed unevenly around the wrold, and there is no enforcement mechanism for a global agreement. And underscoring all of this is a great deal of uncertainty about what will happen 50, 100, or 500 years in the future. I was hoping Schelling could help me make sense of this. Part one of our conversation is below. We discussed the financial crisis first, then moved on to discuss Waxman-Markey and the upcoming Climate Change Conference in Copenahgen. I will publish part two, in which we discuss international collective bargaining, tomorrow morning. My questions are in bold. Conor Clarke: I've been trying to call a lot of economists who don't have blogs, to sort of canvass opinions about the state of the field and particular topics within it. There's been a lot of handwringing in the past couple of months about the failure of economics and in the particular the failure of rational expectations model. What do you think about state of the field and where it's going? Thomas Schelling: The first thing I have to tell you is that I haven't really been a macroeconomist for the last 40 or 50 years. And I never was much attracted to the rational expectations model. I think it imputed too much. Let me put it differently. I think rational expectations can lead to several alternative equilibrium situations, depending on what people choose to expect. If people expect the price of coffee to go up, they will make it go up. And if people expect the price of coffee to go down, it will go down. And the rational expectations model doesn't necessarily tell you what external ingredient beings to sway opinion in one direction or another. But you have written about some things that seem to me quite relevant to this crisis. In particular I'm thinking of your book MicroMotives and MacroBehavior, which deals with how small changes in perception and preference can lead to relatively large macro events that have some tipping points. Yeah, and I did think for a long time that dividends from common stocks were low compared with the return on a decent bond holding, and I thought that's because the market prices had been rising so steadily that taking together dividends and appreciation, common stocks were a very good deal. On the other hand, I thought, if the stock market should ever try to level off, then people would discover that, in the absence of their expected capital gains, they'd be better off in the bond market. And that would mean that it would be every hard for the stock market, after rising as it did for so long, to stop and stay level. It would have to go down, not stop. And once it started to go down it could go down quite substantially. And I think that actually happened. But the current financial crisis is so much more complicated than the stock market! And I have a hunch that not a great many macroeconomists paid much attention to all the different kind of credit systems we have. And I can't be sure because I don't keep up with everything they write, but I think maybe the financial markets became much more complicated than they used to be. And as a result, maybe the macroeconomists just couldn't keep up with all of that. Or maybe it's just that the situation became severely unstable. You know, housing and common stocks were beginning to fall at about the same time, and consumer spending declined partly because of the decline in capital gains. And an awful lot of the prosperity was due to the impact of stock market appreciation on people who began to get used to their capital gains as if they were regular income. [laughs] But that about exhausts my commentary on that subject! Well then let me ask you about something you have been writing about more recently: Collective bargaining over climate change. And I wanted to ask you first about something you wrote for Foreign Affairs seven years ago, about Kyoto: "Global climate change may become what nuclear arms control was for the past half century." Has that come to pass? Congress is dealing with the legislation now, and we go back to Copenhagen at the end of the year. Well, I think international climate change is not yet getting serious attention. I don't expect much to come out of Copenhagen at the end of the year. I think there's too much of an expectation that if you hold a great big conference, something can come out of it. I think the president, and maybe the vice president, should get the secretary of state and the secretary of energy and the head of the Environmental Protection Agency to designate very high level people -- from both parties and both houses of Congress -- and put together a team of 12 or 15 people who would work full time on this. They would negotiate with the British, the French, the Germans and if necessary the Russians to begin to talk about what to replace the Kyoto Treaty with. And it would be their full time job for many months, until they have worked out some kind of an understanding of what their next commitments would be. And I think they ought to drop the idea that there are going to be enforceable commitments. There have never been enforceable commitments on anything of that magnitude. And I think they should try to negotiate not what emissions level they will seek in 20 or 50 years, but what they will actually DO. And when they've arrive at what looks like an understanding they hold a big conference and publicize it. If they can't quite reach an agreement among themselves, then they might see they if they can get the heads of state to come together. But I don't think this kind of work is being done right now. What do you think of Waxman-Markey bill, the American Clean Energy and Security Act? It sets a cap on emissions, but as I understand it the real value is in the effect it might have at Copenhagen. Well let me first respond about Copenhagen. I don't think anything's going to be accomplished at Copenhagen. But they might agree that they will cap the global temperature increases at 2 degrees Celsius -- that's one of these useless things that people love to talk about. Or they might come up with an agreement that the amount of CO2 in the atmosphere should not exceed 450 parts per million. Again, that's no commitment because it's just setting a goal that's supposed to be aspirational. And you say that because there's no enforcement mechanism? Not just because there's no enforcement mechanism. I don't worry much about enforcement. I think that if the major countries reach an agreement they'll do their best to do what they said they would do. But if you say what you're going to do is get emissions down by 15% in 20 years, none of them knows what that means. That's not a commitment to something they're going to do; that's a commitment to some vague aspirational goal or something. My comparison is to NATO. The NATO treaty was only two pages long. There was never any enforcement mechanism to make the French or the Italians or the Dutch or the British or the Americans do what they said they would do. But for the most part, they did it. Because when responsible governments make serious commitments, they stick to them, especially when they see other governments sticking to them. But their commitments were not, "How much will we reduce the likelihood of a Soviet attack?" or, "How much will we slow down a soviet attack?" The commitments were about how many young men they would draft into their armed forces. About how much they would spend on guns and ammunition and vehicles. How much real estate they would provide for military housing and pipelines and military maneuvers. They were all commitments to things they could do. So you could look and see that the French were doing what they said they would do. And the French themselves would know if they were dong what they said they would do. And so I think what is needed -- if we had a good bill, and I don' think the Waxman-Markey bill is anything to be proud of -- is to take a good bill and display it to other large countries, and say, "This is what we plan to do. What do you plan to do?" And then hash it out over the next year. I can of see why saying "we're going to reduce the total amount of emissions in the world by X percent" might be kind of a vague, aspirational goal for a global climate conference. But for a nation, why can't it be very concrete? Why can't we say, We want this level of emissions, and we're going to introduce a price mechanism -- a tax or a cap and trade system -- and we're going to let the private sector sort out the rest? Well, my only objection to Waxman-Markey is that it's such a hodgepodge, with all kinds of escape valves. And I don't think it's specific enough on what the cap will be from year to year to year. And also, it's 1,200 pages. And 1,200 pages implies that it's an awfully complicated hodgepodge. If you were putting a cap on oil at the wellhead -- and a cap on coal at the minehead, a cap on gas at the wellhead, and on oil and gas at the port of importation -- so that it was essentially a cap on the fossil fuels, rather than trying to put a cap on electricity in the middle west versus electricity in the South. Or a cap on various manufacturing industries. Or a cap on refineries, even. That seems to me a not very serious way to tackle the problem where it originates. And my actual feeling is that the best you can hope for with this Waxman-Markey bill is that it'll take a few years to discover that it's a huge nuisance of the problem, and they ought to find a way to simplify it. And the way to simplify it is to put the cap on the fossil fuels, not on different industries.